Another day at Arastan: a new tribal rug arrives, we learn about another weaving technique, we are awed again by a brilliant skill. 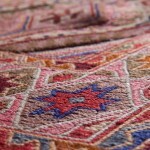 Today’s splendid new product is the Daizangi kilim from Afghanistan. Though often confused with Berjista or Mashwani Nakhunak kilims, Daizangi kilims in fact constitute a genre apart. The Daizangi are a Hazara tribe from western Afghanistan, living mostly in Badghis and Herat provinces. Daizangi women typically weave on their own looms in village homes, using designs common to their tradition, but also adjusted to suit the requirements of modern rug traders. Like other Afghan tribal weavers, they incorporate multiple weaving techniques in each rug. Most frequently they combine a background made with weft wrapping (sometimes known as plain soumak) with design elements in knotted pile.